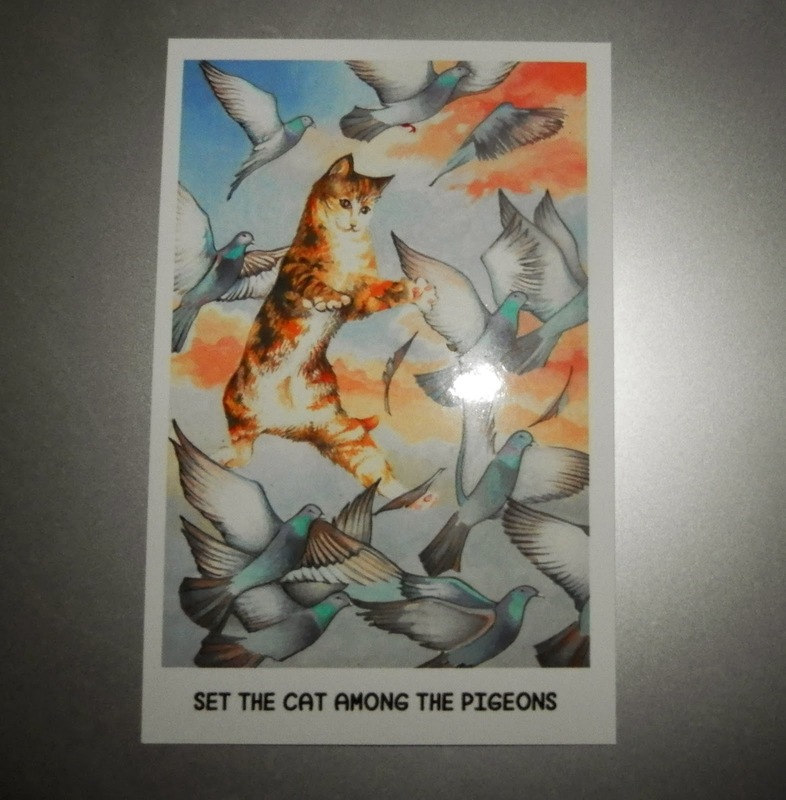 Today's Draw: "Set the Cat Among the Pigeons" from the Oracle of Proverbs by Delphine Sutherland. If you knew you'd be shunned by your community for doing what you believe is right, would you do it? Would you willingly retrain your brain to think a different way than it does now? Are you the cat or the pigeon? The Oracle of Proverbs is a lovely 34-card oracle deck featuring proverbs. I like decks with writing on them, because words trigger me intuitively in the same way art does. A lot of the mass produced oracle decks feature over-the-top fantasy drawings and things like angels and fairies. I'm not really into that, so it's nice that this deck has the kind of art it has. I mean, look at this image. Just lovely. Anyway, I had never heard this proverb before, so that was a bonus. I got to learn something new. What "set the cat among the pigeons" means is to stand firm in your truth. The book goes on to say that the decision you've made may cause a stir or go against the grain, but if it's true to you, do it anyway. Oddly enough, a situation like that came up today. I'm big on standing firm in my own truth and have sacrificed many things because of it. When you're in the majority, standing firm is no big deal. But when you're in the minority—or when you're standing alone—it can cost you. It usually costs in terms of friends or associates, which can precipitate other losses, like a domino effect. It's hard to zig when all the "power" is zagging. And by power, I mean the power of popular opinion. But popular opinion is not always right. And many of the people making it popular are just following the herd out of fear. Some are misguided or lacking information. And some, of course, are there by choice...because they feel it's the right thing for them to do. There's a word for standing firm in your truth—integrity. Sometimes, though, integrity hurts. And it hurts because within us all is someone who just wants to be affirmed and know they're OK. And when the numbers are against you, sometimes "I'm standing in my integrity" doesn't feel like enough. But as far as I'm concerned, it sure as hell beats knowing you're being a hypocrite. So once again I'm in the unpopular minority on a matter. And there's always an inner fear that says, it's safer to follow the herd. But yesterday we talked about spiritual maturity and immaturity and how a move toward universal love spells the difference between the two. And using that measure, I'm 100% certain that the popular kids are staying stuck in a spiritually immature state on this matter. They feel they have a moral high ground, so it's OK to hate and seek revenge and find guilt by association. The Nazis thought that was OK too. They couldn't see far enough past their ego to see how wrong they were socially, spiritually, humanly...every which way. See, saying you believe in forgiveness and tolerance and "live and let live" is really easy when you dehumanize all the people you find hard to forgive or tolerate. Integrity comes from practicing forgiveness and "live and let live" when it's hardest to. That doesn't mean you have to hang out with the person, but it does mean you have to stop perpetuating hate and revenge. It also means you have to honest enough with yourself to see when that's what you're doing. The Buddhists would go further to have you send them love and peace. I'm not quite there, but it's where I'm headed. Because that's where I think the moral high ground is...in love. It seems this week's topic might be about spiritual maturity and making the choice to love/accept/forgive when it's the hard thing to do. My spiritual journey began in many ways by "forgiving the unforgivable" 25 years ago. And one thing I really want to do is write a book about pushing yourself to do the hard thing, spiritually speaking. I feel like a lot of people kind of hit a wall when they get to the place where they have explored their beliefs, have a strong sense of a higher power and feel they're a good person. Once there, they feel like they're done (or on the maintenance plan.) And hey, they're done enough. They're certainly more "done" than the masses. But they've only gone as far as a person can go without facing the discomfort of battling the final ego concerns that stand between what they believe is the right way to be and truly being that way. It means being willing to see your own hypocrisy and do something about it, quite honestly. I want to see what it's like to stand firm in that truth without fear, wavering, denial or letting the needs of my ego get in the way. I want to be comfortable in that without the inner dialogue that makes it so hard and even painful. To get there, we HAVE to zig when others zag because the zeitgeist hasn't even reached the wall yet, much less ventured beyond it. So if standing firm on the principle of universal love/acceptance/forgiveness ruffles some feathers in the flock, I can live with that.